WordPerfect 5.1 for DOS keytop labels place the most commonly used software commands that you need directly at your fingertips so you can use the software faster and more efficiently. The WordPerfect 5.1 for DOS keyboard labels include durable plastic labels that go directly on your keyboard keys. 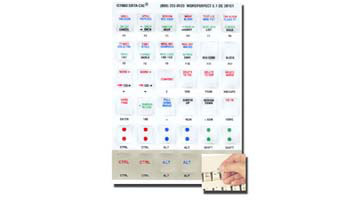 The labels are printed in color and die-cut for easy installation and use. The labels feature the most commonly used function key commands for quick and easy reference. The labels include the Shift, ALT, CTRL, ALT+Shift, and CTRL+Shift function key combinations in clear, color-coded format. The labels also include some of the more commonly used control key commands and formatting commands.